Welcome to TINSA Ltd. Website! Notified Body NB 2387 as per Directive 2008/57 ЕC of the European Parliament and of the Council of 17 June 2008 on the interoperability of the rail system within the Community with Permit №1/04.07.2012, issued by the Minister of Transport, Information Technology and Communications of Republic of Bulgaria. Assessment Body EIN number BG/36/0015/0001, recognized with Certificate of Assessment Body for Independent Safety assessment, according to Commission Implementing Regulation (EU) No 402/2013, issued by the Railway Administration Executive Agency. 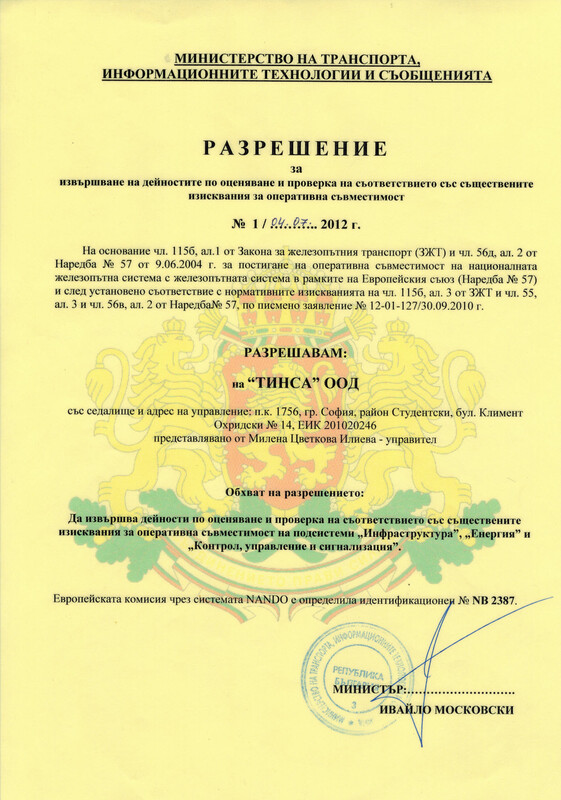 Type A Inspection Body with Certificate of Accreditation №182 ОКА, according to BDS EN ISO/IEC 17020:2012, issued by the Bulgarian Accreditation Service Executive Agency. TINSA Ltd. is a member of the Coordination Group of Notified Bodies NB-RAIL for Directive 2008/57/EC on Railway Interoperability.